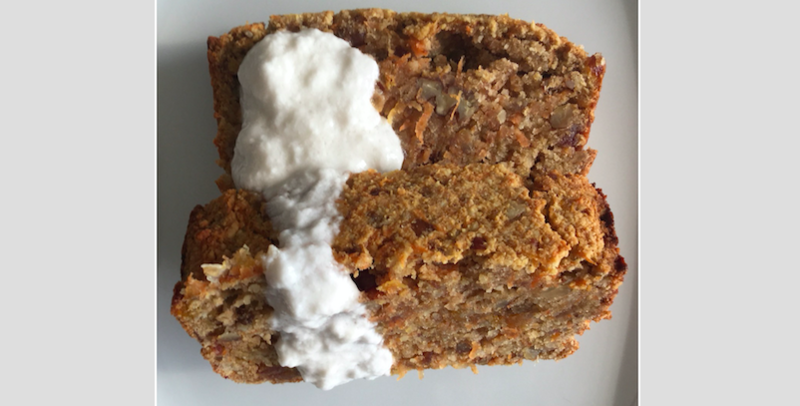 I’ve finally perfected the paleo carrot cake! It’s golden and lightly crusty on the outside, and wonderfully moist inside. If like myself, you’re not actually grain or dairy intolerant, I advise eating this cake with a cream cheese frosting. For true Paleo’s, I advise using coconut cream, as in the photo, however I also love this plain or toasted. As always please try to source organic/bio ingredients for your own health and that of the planet. Enjoy and let me know how you get along! 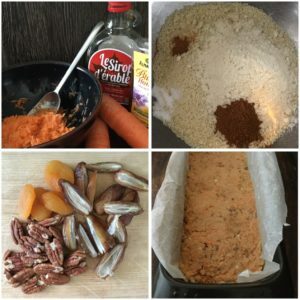 Peel and grate the carrots and place in a bowl with the maple syrup and honey. Put to the side to marinate. Turn the oven on to 180°C and line a loaf tin with parchment paper (Tip: wet the baking paper first and scrunch it up to make it easier to mould into your tin. Place the almond flour, coconut flour, baking soda, cinnamon & nutmeg in a large bowl and mix well. Add the chopped or food processed pecans (depending on how big you like your nut chunks) and put to the side. In another bowl beat the eggs well and add the coconut oil. Blitz the dates and apricots in the food processor so they are well chopped up. Add the egg mixture and dates mixture to the large bowl of dry ingredients, and mix really well. It should be wet, but not so liquidy that it will pour into the loaf tin. Spoon the mixture in and pat down well with the back of a metal spoon. Place in the oven for 15minutes before turning the temperature down to 150°C for another 30 minutes.